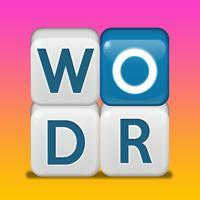 A word search game where you must find words in an irregular grid of letters. The twist is that once found, the word is removed from the board and remaining letters fall toward the bottom center of the screen. Some words start out split by letters from other words, so you have to find the right words to start with and then proceed in order to get them all. It’s not especially difficult, but I find it a nice activity to relax with that requires just the right amount of attention and energy. Unfortunately, this mood is completely ruined by aggressive monetization. The game pushes you toward a few different boosts that can be purchased as microtransactions - this is annoying but can be mostly ignored, as the boosts are far from necessary to solve the puzzles. What you can’t ignore are the very frequent ads. The game waits until you’ve played a few levels to start showing them, but then I was seeing one after literally every level. There is, of course, an in-app purchase to remove the ads, but why reward this behavior? Everything about the game experience thus far suggests the design prioritizes money-grabbing over providing the player with a quality experience. I’d rather spend my time, attention, and money elsewhere. I Stopped Playing When: Once the ads started coming after every level, I dropped the game.